try to impose austerity and attack public services. LMDOC is supported by GLATUC, TUC/LESE , UNITE London & Eastern Region, CWU London Region, PCS London & South East Region, ASLEF, RMT, TSSA, NEU, MU London, Bectu/Prospect, FBU London & Southern Regions, GMB London & Southern Regions, UNISON Greater London Region, Peoples Assembly, NPC, GLPA & other Pensioners’ organisations and organisations representing Turkish, Kurdish, Chilean, Colombian, Peruvian, Brazilian, Portuguese, West Indian, Sri Lankan, Indian, Pakistani, Bangla Deshi, Cypriot, Tamil, Iraqi, Iranian, Irish, South African, Nigerian migrant workers & communities plus many other trade union & community organisations. 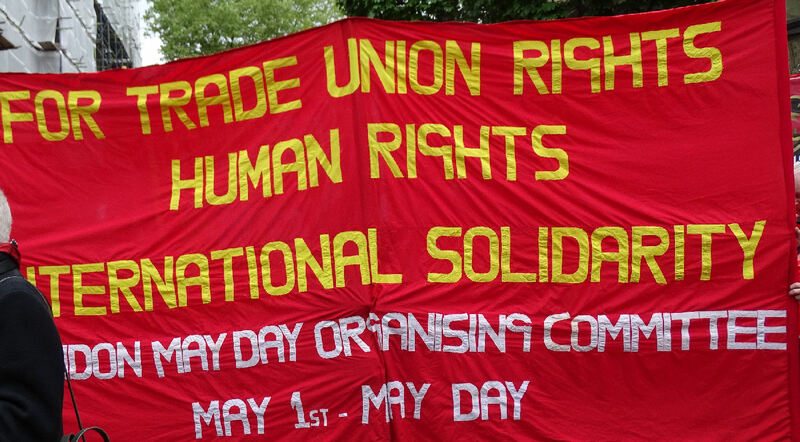 London May Day was celebrated by thousands of trade unionists, members of migrant worker and international communities and students as they marched from Clerkenwell Green to Trafalgar Square in glorious weather. 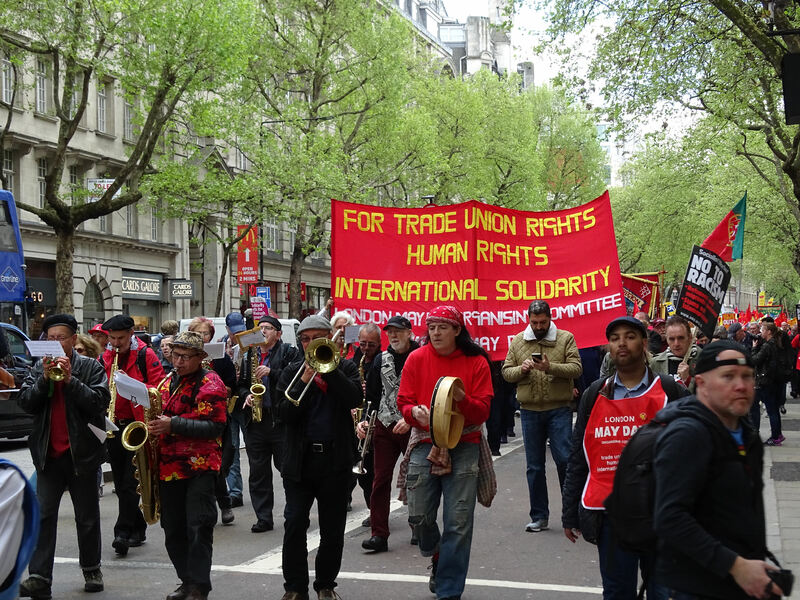 Led by the Big Red Band the colourful march saw the thousands marching in solidarity. They included those involved in key union struggles at TFI Fridays (Unite), PictureHouse (BECTU), Dial-a-Ride (Unite –on strike on May Day) and, of course, RMT involved in so many epic battles particularly the 2 years plus at Southern Rail. Banners & flags came fromunions ASLEF (including one from Salisbury Branch); TSSA, RMT, UNITE, BECTU, UNISON, PCS, CWU, POA, FBU plus SERTUC, GLATUC and the ITF. 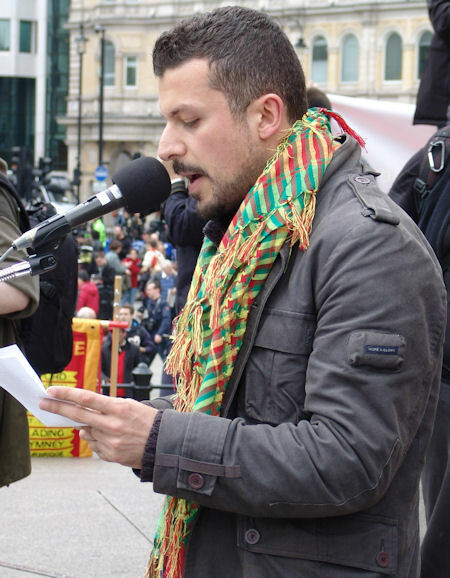 This year's May Day pays tribute to MEHMET AKSOY. He was killed in Syria whilst filming with the Kurdish YPG. Mehmet, a leading figure in the Kurdish community, was a great supporter of London May Day and the working class struggle. and for what we need such as good public housing, proper safety at work & where we live and equality for all. We have seen what unfettered private greed leads to with Grenfell and in the corridors of our hospitals. We fight for a better world based on class justice. We want an end to the society that pours massive riches on the top fatcats whilst cutting our pay & social benefits. After Brexit we have to fight for our employment & social rights. We also have to expose the continuing racist attitudes that have most recently been shown up by the treatment of the Windrush generation. 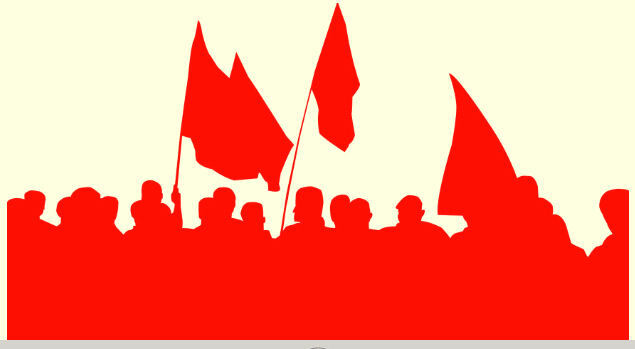 We will be welcoming workers from our many intenational communities and migrant worker organisations on May Day.